Welcome back to my blog, today’s article will show you how to use WhatsApp web (or Wapp web). Surely already you know WhatsApp, the most popular messaging application in the world for your device, be it Android, Windows or Apple. Perhaps some of you, however, do not know that there is also the possibility of using the application from your PC, using the browser and the online application called WhatsApp web. To be honest this article has been recommended to me by my wife since she has asked me dozens of times to find the application to connect to WhatsApp from PC because it is much more comfortable to use when using her personal computer. 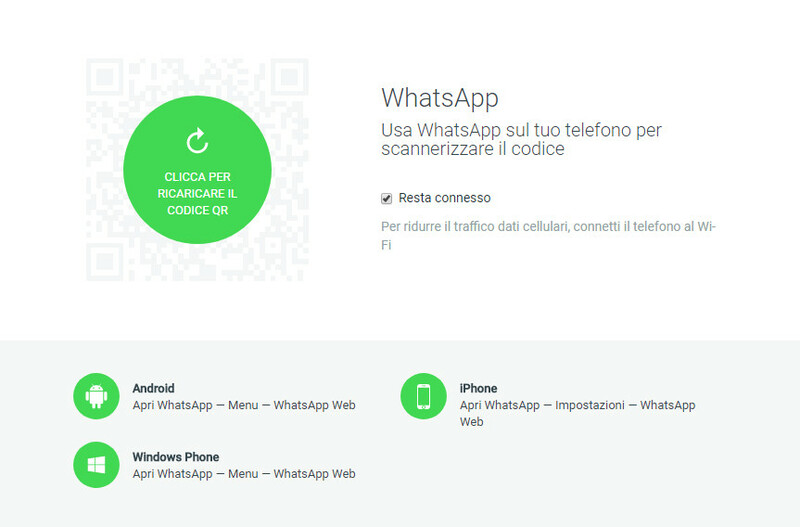 WhatsApp web – Wapp web- What is it? WhatsApp web can be seen as an extension of your account on your mobile device, accessible from the PC. Any message sent or received in one of the two systems will be immediately visible on the other, in a fully synchronized manner. Basically, you will access the same account on both your PC and your Smartphone or Tablet and you will see the same contents on both devices. As you can imagine, owning a WhatsApp account on your device is a basic prerequisite, followed by a good Internet connection both on your PC and on a mobile device. Warning: If your device is turned off, you will not be able to use WhatsApp web as the application works as a replication of what happens on your device, if it is unreachable, you can not write or receive anything. Also be aware of the browser you are using, not all are compatible with Wapp web. Chrome, Firefox and Microsoft Edge are compatible, Explorer no. Also from the official website shows that not all devices are compatible, they can use the web application only: Android, iPhone 8.1+, Windows Phone 8.0 e 8.1, Nokia S60, Nokia S40 EVO, BlackBerry and BlackBerry 10. We come to the point and see how you configure WhatsApp web. Next, access WhatsApp from your mobile device and search for the “WhatsApp Web” option among the options. On Android you should find it in the main menu on the chat screen. At this point you will be shown the screen from which you can start reading the code shown on the site (see the first picture of the paragraph). Click on “Ok I understand” in the bottom right, your camera will be activated which you will use to frame the code shown on the site. 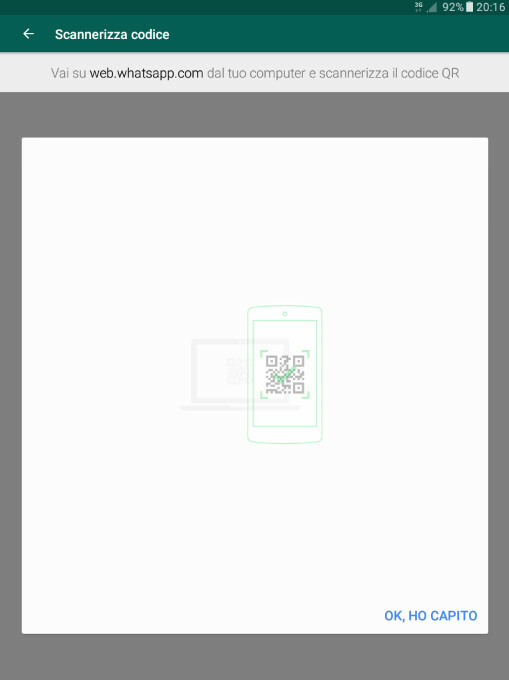 Frame it for a few moments and the application will be automatically configured and ready to use. Well you are ready to use WhatsApp from your PC, you can immediately test it and check that everything you write and read on your PC see it on your mobile device and vice versa. This way you will not have to disconnect the desktop device connected to Whatsapp Web to configure a second one. You can also activate the notifications so you will be notified even if you have the closed browser window. As you have seen, it is easy to use WhatsApp from your PC. It ‘very useful if you are more practical to use a PC keyboard rather than a digital Android or maybe you have your Smartphone charging and do not want to get up every minute to respond to newly arrived messages. Also be careful to leave your cell phone unattended if you have a girlfriend or husband / jealous wife because you may decide to use WhatsApp web to read the messages you send or arrive. Of course, it must have time to configure it and disable its notifications. To date, if a Web WhatsApp is active on some desktop, it is reported by a permanent notification on the mobile device. This makes you immediately discover any tricks put in place by jealous partners. Remember to subscribe to my YouTube channel and / or one of my pages to stay up-to-date on my latest articles and videos.